Society has no patience when it comes to crimes of violence. Prosecutors aggressively pursue charges, Judges tend to not be lenient, and sentences can be severe. If you are charged with a crime of violence then it is crucial that you retain counsel as quickly as possible. An experienced lawyer can assert defenses on your behalf and, if necessary, can take your case to trial and dispute guilt. As a Peoria criminal defense attorney, I handle handle violent crime charges in Illinois. Contact my office today to schedule an initial consultation. Common issues which arise in these types of cases include whether or not the police illegally seized evidence, whether statements were taken in violation of a defendant’s Fifth Amendment rights, whether the accused was acting in self-defense, or whether the case involved a matter of mistaken identity. Hiring an attorney is important in establishing any of these issues. As a Peoria criminal defense lawyer, I will aggressively protect the rights of the accused in an Illinois violent crime case. I will use your initial consultation to hear your side of the story, to help you understand what it is you should expect from the process, and to make sure you understand the possible outcomes of your case. I will quickly obtain evidence such as police reports, witness statements, etc. If necessary I will hire my own investigator and he will visit the scene of the offense. All possible Motions will be filed and my firm will prepare you for trial. You are facing a serious situation and our attorney will take it seriously. Contact me today. 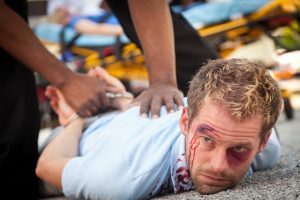 If you are charged with a violent offense then you are likely facing a term of incarceration. It is important that, at a time like this, you have an attorney who will answer your questions. I make staying in contact with my clients a priority. I quickly respond to phone calls and emails. I also often provide clients with my cell phone number and I may be reached via text message. I will make myself available to answer your concerns and will work to keep this promise in each and every case I handle.